Is Parkinson’s curable? My answer is Yes, Parkinson’s is curable! There, I said it. Your turn…take a deep breath…now, all together, let’s say it: Yes, Parkinson’s is curable. Doesn’t that feel great? I agree. It feels great! Click here and you can read it for yourself. The Parkinson’s Recipe for Recovery® is a road map to your cure from Parkinson’s. 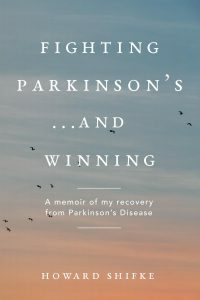 I want you to embrace the Recipe as a Parkinson’s cure and feel encouraged and empowered. Feel encouraged and empowered to be your own Parkinson’s cure. So far, four of us who did the Recipe are cured, and many of you are doing the Recipe and you are halting, slowing, and reversing the progression of your Parkinson’s — you are extraordinary!!! If you are taking medications and by doing the Recipe you have not had to increase your medications, you are halting, slowing, and reversing the progression of your Parkinson’s. If you are taking medications and by doing the Recipe you have been able to decrease your medications, you are halting, slowing, and reversing the progression of your Parkinson’s. If you were taking medications and by doing the Recipe you have completely gotten off of your medications, you are halting, slowing, and reversing the progression of your Parkinson’s. If you have briefly tried medications and stopped and by doing the Recipe you are remaining drug free, you are halting, slowing, and reversing the progression of your Parkinson’s. If you never have taken medications and by doing the Recipe you have no intention of ever taking medications, you are halting, slowing, and reversing the progression of your Parkinson’s. If you did the Recipe, and stopped doing the Recipe after the disease went away, you are cured, and you did it by being your own Parkinson’s cure. Is Parkinson’s curable? Yes, Parkinson’s is curable! However, you need to be your own Parkinson’s cure. However, to be your own Parkinson’s cure, you need to be your own cure on your life path. Parkinson’s is a very big symptom of life being out of balance, soul, mind, and body. No pill and no brain surgery can bring your life back into balance. You need to do that. The journey is a glorious journey…yes, a stiff, shaky, slow, painful, teary journey…but a glorious journey just the same. The journey is to bring your life back into balance, and then the Parkinson’s ceases to exist. That is why the Recipe is a Parkinson’s cure. It shows you how to eradicate the cause (soul, mind, and body out of balance), and then the symptom (Parkinson’s) ceases to exist. Will the Recipe “lessen the effects of Parkinson’s symptoms for some window of time” or “mask the symptoms?” Generally, no. Can the Recipe result in you being cured from Parkinson’s? Absolutely yes! You are so much more than Parkinson’s symptoms. You are living, breathing, beautiful people around the world. PD as a glorious journey to restoring a healthy life? Yes, yes, yes. I know this in my heart. 1. high renown or honor won by notable achievements. antonyms:	praise, worship, and thanksgiving offered to God. 3.a luminous ring or halo, especially as depicted around the head of a saint. Hi Howard, you truly are Inspirational. One of my favourite people is Wayne Dyer. He says Inspiration comes from being ” In Spirit” Howard you are so ” in spirit” it is almost like you are on the hotline to heaven. I want you to know how each and every time I call out to God for help, he answers me DIRECTLY through you. Your words resonate so deeply within my heart, you calm my fears and lift my soul each and every time. You truly are so connected to the voice of your soul, it’s love and tranquility radiate through your words. This journey is about guiding my life back into balance and to completely reconnect with my soul. If that enables me to be half the quality of the person you are, I will be truly Joyous. God Bless You my friend. You make such a difference in my life. THANK YOU! Thanks for sharing. I hope that you have your best weekend ever! hi Karen es una verdadera coincidencia justo ayer , yo vi un video de Wayne Dyer , “EL PODER DE LA INTENCION” y es maravilloso . el parkinson es curable mucha gente se ha curado. a lo largo de la historia el ser humano se ha curado a si mismo de todas las enfermedades existentes . hi Karen is a real coincidence just yesterday, I saw a video of Wayne Dyer, “THE POWER OF INTENTION” and it is wonderful. Parkinson’s is curable many people have been cured. throughout history man has cured himself of all existing diseases. This is brilliant! Everything you have stated here is so completely true. And poignant. The concept of healing the soul – mind – body imbalance is the essence of healing the Whole. The physical manifestation – the symptoms – evaporate when the imbalance becomes balanced. The daily practice of the Recipe restores the balance spiritually, mentally, physically. You practice, you restore, you comprehend, you balance, you heal. I am responsible for my life, my own direction, my balance. I am my own cure on my life path. Such gratitude to you my friend for sharing your roadmap and your brilliance. Love to you and all you gracious people on your curing paths. A very timely message once again. Thanx, Howard! Bless your heart Little Miss Sunshine. Thanks for sharing yourselves with me. I love to read all your comments and to feel your great spirits shining through. I am with Howard all the way…Parkinson’s is curable and I am my own Parkinson’s cure. Parkinson’s is curable…….Howard and the others are living proof of this! I am my own Parkinson’s Cure! I know that each one of you are worth it. Debbie, beautifully said. I am so excited for you going on this cruise with your wonderful husband. I am so thrilled that you feel so good physically that you are upto the trip, that is amazing and wonderful to hear. Have an absolute ball my friend. Truly joyous news. Well done to you and your beautiful soul. I am so grateful for this site, for all of your comments and for the support Howard so unconditionally and generously offers each of us to keep us motivated to press on to that finish line. He genuinely wants that for each of us as badly as we do! Bless you, dear Howard! Hi Jimmy, yes ” the power of intention” is wonderful. I watch Wayne all the time on YouTube. My favourite seminar that he has done is ” Inspiration” but I don’t think it’s on You Tube any more. We have our very own Inspiration in Howard. I hope life treating you well in Mexico Jimmy. I am halting,s lowing and reversing the progression of my Parkinson’s. It is curable I am curable now. I am recovery I am extraordinary. Yay. Thank you for your guidance Howard and love.